The Dramatic rouge pout is back for Fall 2012 -- red is always right for Fall but it's also captivating a new hue using deep milled-wine stains which are rich in chocolate undertones. For ultimate look I recommend a matte finish which you can spice up with a gloss if needed! A lip exfoliator once a day is great for keeping lips looking smooth when painted a red. Colour blocking is making its way from summer clothing to the eyelids this season. Teal Greens, Cobalt Blues, and Bright Purples make the perfect colour blocking combination for Fall 2012. Get the peacock eye look by blending all three colours on the eye like pictured below. 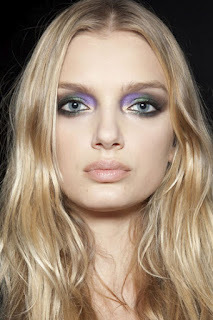 The Smokey Eye is always in but this season it's spiced up by smoking outside the box using brown and purple tones. 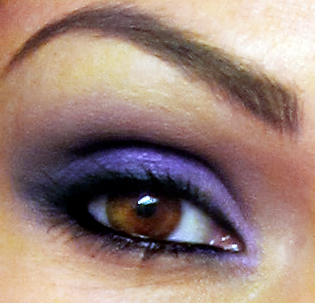 Purple tones really enhance brown and green eyes. Try a simple grey or brown to bring out a blue eye. 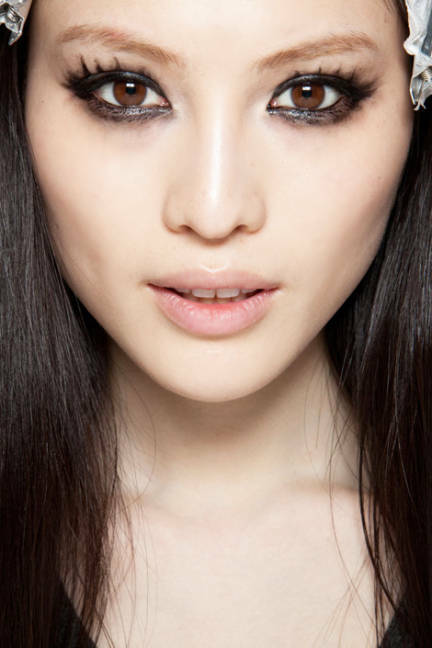 Sketched Eyelashes are created by adding and blending strokes of eye shadow to mimic the look of lashes. This look was hot on the runway and red carpets for Fall 2012. 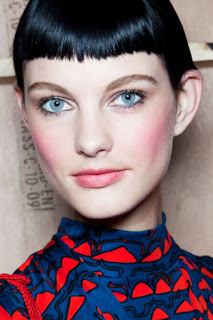 Weathered Blush is the look for 2012 by adding warm blushers to the cheeks to create a wonky flush of winter. By adding colour to the cheeks you can give the illusion of a tan without using a bronzer. Blushers really brighten then face. Defined Brows are back in style thanks to celebrities like Megan Fox and Kim Kardashian. The brow is the initial frame work to the face and by thickening the brow you're creating a luscious bold statement. To fill in the brow simply use a pencil followed by a shadow to set it with a stiff angled brush. An eye shadow alone will do the trick and will look completely natural.